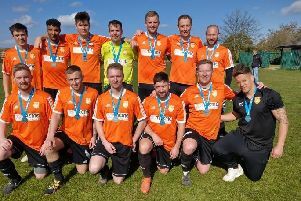 Pinchbeck United boosted their chances of finishing runners-up in the ChromaSport & Trophies Peterborough League Premier Division last night (May 4). The Lincolsnhire side won 2-1 at Ketton through two goals by Ian Dunn to move five points clear of third-placed Netherton United with two games each left to play. Pinchbeck can mathematically still claim the title but that’s unlikely with league leaders Peterborough Sports Reserves needing just one more victory from their three remaining games to wrap it up.